After launching its 3G services in Bengaluru, Chennai, Coimbatore, Mysore, Manipal, Udipi, Jaipur and Delhi NCR, Airtel finally launched its 3G services in Mumbai. Airtel is the second private company to offer 3G services in Mumbai, after Reliance Communication which launched the 3G back in December last year. Airtel 3G comes with the Mobile TV, which allows you to watch more than 100 live channels on the go. Commenting on the 3G launch in Mumbai, Atul Bindal, President – Mobile Services, Bharti airtel said, “Mumbai is the commercial and entertainment capital of India – and therefore at the leading edge of driving a paradigm shift from voice to data services. With the highest data penetration in India of over 20%, the city of Mumbai truly represents the data revolution story that our country is currently witnessing. As we bring the power of 3G to Mumbai today, we are confident that this launch will add impetus to the expansion of data services in India. Whether stuck in office, or on the move – all Mumbaikars can now experience airtel 3G services and enjoy high speed internet access and a host of other exciting services on their mobile devices”. Airtel has won 3G license for 13 telecom circles in India – Mumbai, Delhi, Tamil Nadu, Uttar Pradesh (West), Rajasthan, Andhra Pradesh, Karnataka, West Bengal, Himachal Pradesh, Bihar, Assam, North East, Jammu & Kashmir. Airtel will launch their 3G services in all of the 13 circles before the end of this month. Airtel 3G packs starts from Rs.8, which offers 10MB with a validity of 1 days. You can also purchase the time-based 3G plan for Rs.41, which allows you to access 3G for 30 mins. 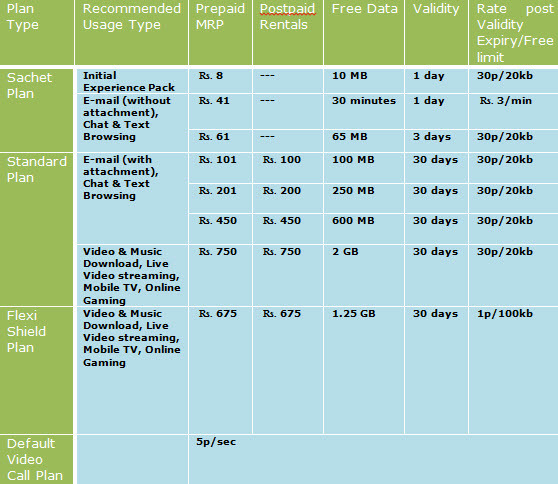 The so-called unlimited 3G plan is available for Rs.675, which comes with 1.25 GB of free data. After using the data, you will be charged for 10p/MB with a bill limit of Rs.2000. It means that, you will get 14GB of data per month for Rs.2000. Check out the complete Airtel 3G plans below.